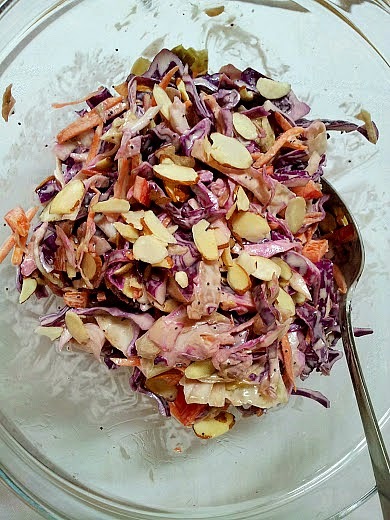 This is coleslaw week at Food Network's #Summer Soiree and I thought I would share one of my favorite recipe with you...Apple Cider Coleslaw. I am not a fan of overly creamy salads. They are too heavy for me and get soggy so quickly. I miss the crunch of the vegetables and the "healthy" factor. This version has only 1/4 cup of mayonnaise in the entire recipe and has a sweet/tart taste with the addition of apple cider vinegar. 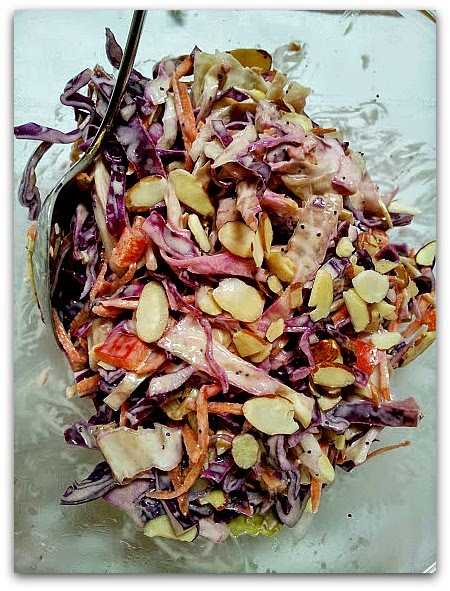 A mix of red and green cabbage, carrots, sweet red bell pepper and crunchy almonds, this dish is perfect for all your summer favorite foods like fried chicken, ribs, burgers, pulled pork sandwiches and hot dogs. But I also love it in less traditional ways...How about on fish tacos? Or burritos? Topping a tuna salad sandwich? I even like scooping it up with crunchy corn tortilla chips. Give it a try and please let me know how you will serve the coleslaw. Add cabbage, bell pepper and carrots to large bowl. In a small bowl add vinegar, mayonnaise, 1 tbsp olive oil, mustard and celery seeds. Whisk until combined. Add pinch each salt and pepper. Taste and adjust seasonings if desired.Add additional tbsp olive oil if the vinaigrette looks too thick. Pour half of vinaigrette over cabbage mixture. (Refrigerate remaining vinaigrette) Stir to combine. Refrigerate for a minimum of one hour. Remove from fridge. Stir and add additional vinaigrette if desired but do not overdo...You do not want it to get soggy. 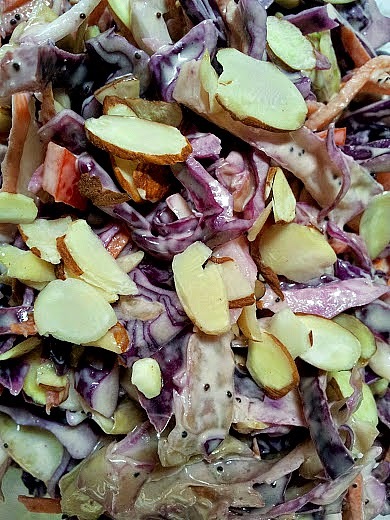 Sprinkle almonds over salad and serve cold. This slaw keeps in the refrigerator for up to 2 days. Do not add almonds until ready to serve. It is "Coleslaw" week at Food Network's #Summer Soiree roundup. Check out the other delicious sounding recipes from my blogger friends. Have a favorite coleslaw recipe? Share in the comments section and/or link to your blog if you have one.